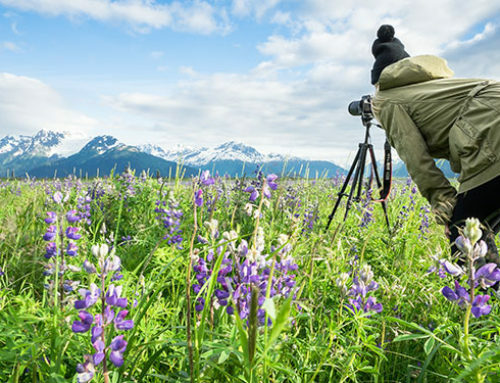 No doubt about it, seeing and photographing wildlife is a main attraction for many visitors traveling to Alaska, but the state is large and finding them takes planning, patience and luck. The type of wildlife you’re looking for plays a big part in the planning process. Not all animals are active year-round… or even here. 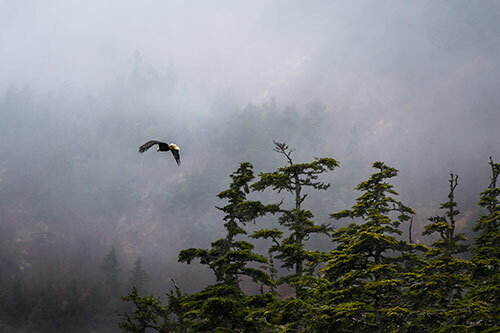 Alaska is host to many migratory species such including birds and whales. And of course, bears make themselves scarce during winter months. 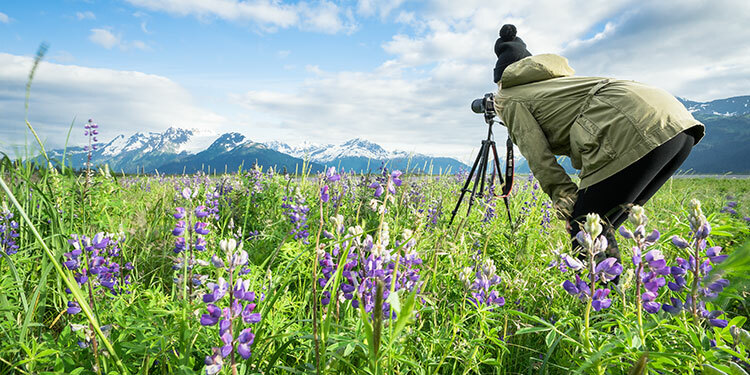 Check out Insider Tips – Top 30 Things to Photograph in Alaska and When to Shoot Them to get a good idea about the best times for certain species. Safety should always be the primary concern. Not only can animals be dangerous, Alaska contains vast tracks of wilderness and many hidden dangers for unwary travelers. It’s always best to book with an experienced and reputable local guide when going into backcountry. 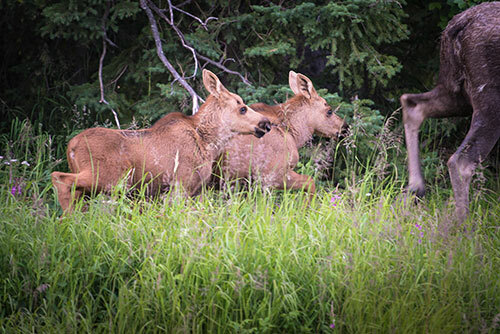 Quite a few resident moose frequent Anchorage’s trails and parks, and are less skittish than their remote relatives. Still, they are not tame and should be treated accordingly, especially when cows are protecting newborn calves in spring and summer. A safe viewing distance will be at least 50 ft [15 m], and there should always be a large object between you and them, like a tree or car. Watch for signs of stress or aggression, especially if the moose stops eating to look at you. Flattened ears, lowered head, raised neck hairs and smacking lips are all signs it’s time to retreat to a safe place. 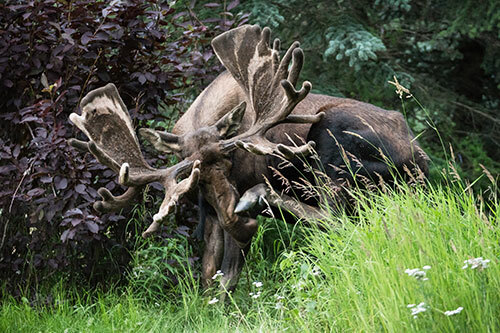 As gangly as they appear, moose are surprising agile and can run up to 35 mph. Keep in mind they don’t always give warning when about to attack, and they are quite capable of covering distances fast to inflict serious damage upon your body with their sharp, flailing hooves. Although both brown and black bear are sometimes spotted along roads and trails, it’s best not to go looking for them in the wild – except for viewing locations in Katmai and Lake Clark National Parks where bears congregate at food rich locations and generations of them have become used to being observed. These are well regulated sites where bears have come to see people as neither threat nor food source and are not stressed by humans. When traveling on wilderness trails, it’s a good idea to be noisy and alert bears of your presence. Surprising them can be dangerous, especially if it’s a sow with a cub or bear on kill. Keep a fresh can of bear spray easily accessible and if possible, travel in groups. Bears will almost always avoid humans if given opportunity. In the unlikely event you encounter a bear that’s displaying threatening behavior, as hard as it may be, do not run! This may trigger a chase response and they can easily outrun you. Keep your face to the bear and try to look big. If part of a group, move in close together. Have the bear spray ready and if the animal charges use it, aiming for the eyes and nose. If the animal attacks, your response will depend on the type of bear. 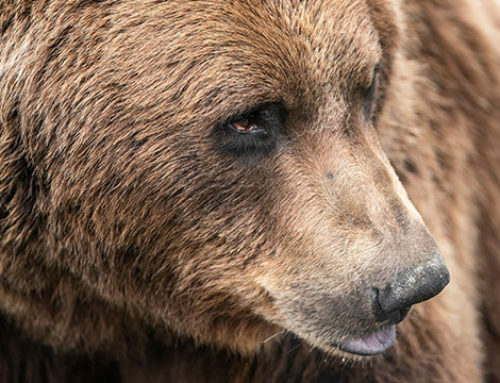 For grizzly or brown bears, lay face down and clasp hands behind your neck. Spread your legs to make it harder for the bear to turn you over. Playing dead will often end an attack, but make sure the bear is well clear of the area before getting up. If the attack persists, fight back with whatever is available, aiming to hit the bear in the face. For black bears, skip playing dead and try to get to a safe place like a car or building. If this isn’t possible, fight back, aiming kicks and blows at the bears face and muzzle. Now that you’re thoroughly frightened of our wildlife, remember, attacks are rare and there are many places where they can be safely seen. 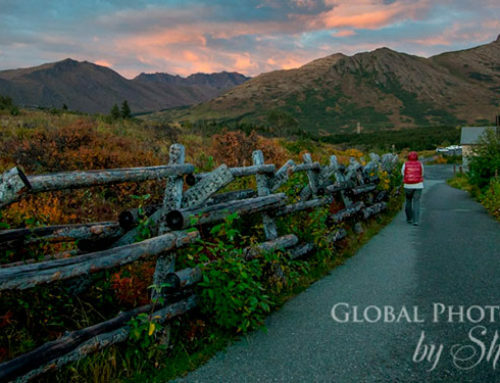 One of the best guaranteed viewing spots is near Anchorage at Alaska Wildlife Conservation Center, where you can photograph 4 of Alaska’s big 5: brown bear, moose, caribou and wolf, all living in large, natural enclosures with vantage points that make it possible to capture them without pens getting in the way. Anchorage is home to around 1,500 moose, 60 grizzlies, 600 black bear, a couple wolf packs, lynx, Dall sheep, eagles and more, so if photographing animals in the wild is more your speed, Sunset Photo Safari is a great way to spot some of them in the area; especially moose. 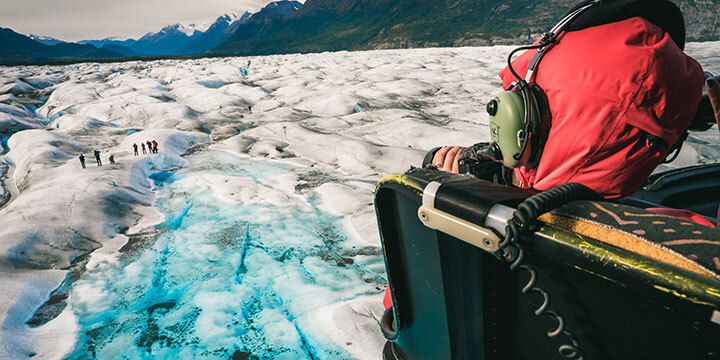 The tour travels to several favorite wildlife habitats at a time of day when they’re more likely to be active, and the expert guide will assist you with safely and competently capturing them. 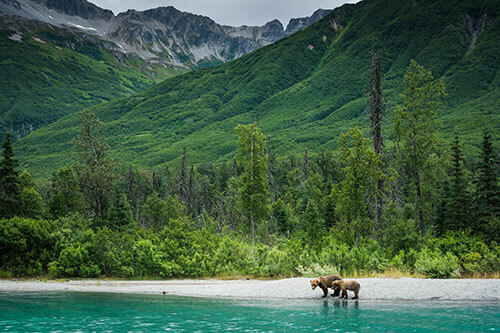 For bear, you might consider a fly-out Brown Bear Photo Safari to Lake Clark or Katmai National Parks to photograph bruins in their scenic, natural habitats. 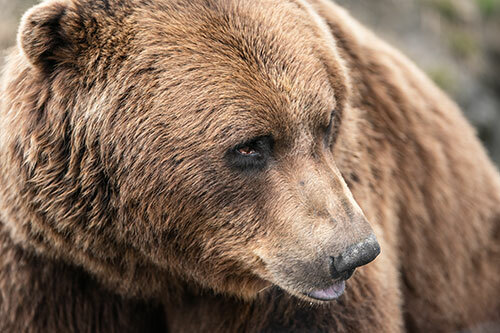 Fun fact: Grizzly and brown bear are the same animal, differentiated only by geography. 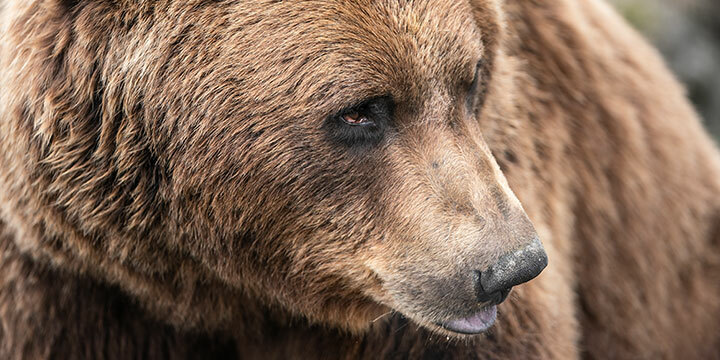 Grizzly bears are inland, while brown bears are coastal. Rich marine foods such as salmon, clams and sedge grasses cause them to grow bigger than their landlocked relatives. Though Denali National Park is the biggest draw in Alaska for wildlife viewing, it’s a vast tract of land where animals can easily make themselves scarce. Kenai Fjords National Park is a wildlife rich location in Southcentral Alaska and one of our favorite places for photography. 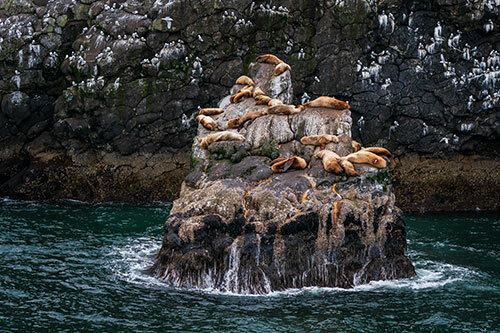 In addition to marinelife like humpback, orca, Dall’s porpoise, sea otters, Stellar sea lions, harbor seals, puffins, cormorants, black legged kittiwakes and other sea birds, you might see land based animals along a scenic shore including: bald eagle, coastal mountain goat, brown and black bear. 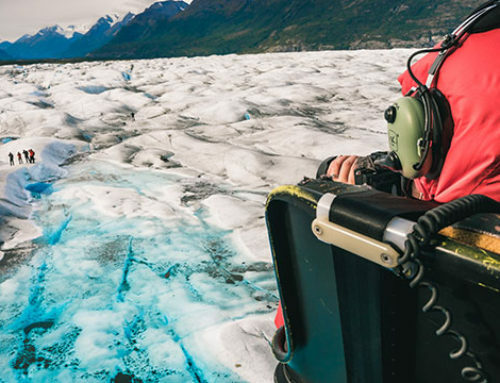 Craggy cliffs and tidewater glaciers provide breathtaking backdrops. 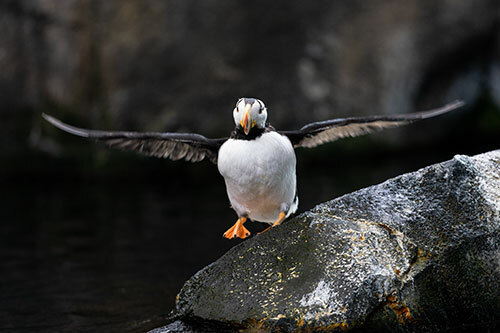 Cruises into the fjords depart from Seward, so when you’re there, be sure to leave time on your itinerary to visit the Alaska SeaLife Center for a close look at cold water marine life. 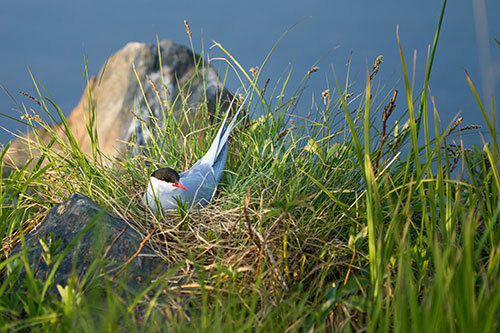 There is an accidental wetlands close to Anchorage that’s one of the most active migratory bird nesting sites in the region. 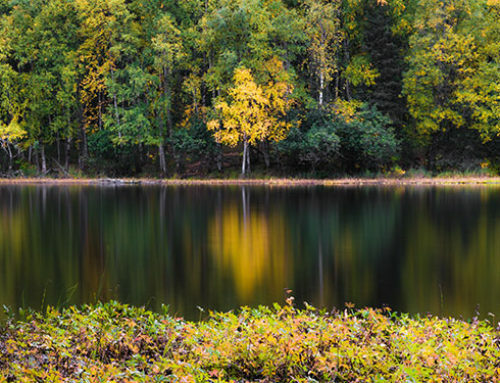 Potter Marsh formed around 100 years ago when bed for the Alaska Railroad was put down. Drainage from the Chugach Mountains was blocked and mixed with tidewater from Cook Inlet, creating the perfect habitat for a variety of animals. From the end of April to September, look for northern pintails, canvasback ducks, red-necked phalaropes, horned and red-necked grebes, and northern harriers. May to August, gulls, Arctic terns, shorebirds such as yellowlegs, can be spotted here. Be sure to look for the eagles nest across from the far east end of the boardwalk. Several species of salmon spawn in the marsh during summer, and the wetlands is frequented by moose and bear, which may be safely viewed from an elevated boardwalk. Also look for the v-shaped wakes of muskrats swimming through the marsh’s ponds and channels. Shutter speed is critical when photographing animate subjects. The good news is, Alaska has plenty of daylight during summer months. The bad news, coastal Southcentral get plenty of clouds, and many animals are most active around dusk and dawn. When dealing with lowlight situations, the best strategy is to open the aperture to the widest setting and raise ISO until the shutter speed is at least equal to or greater than the focal length. You might try shooting in Shutter Priority to ensure the speed doesn’t fall below a safe hand-held speed, but our preferred method is to shoot Aperture Priority and monitor shutter speed, bringing up ISO as needed. Check your camera for some type of follow-focus mode. With Nikon, it’s AF-C, on Canon it’s AI-Servo. Other models use different variations of these terms. The idea is that in these modes, autofocus will continually update to track movement of a subject. Strive to lock focus on an animals eye. That’s the part of the subject that should always be the sharpest. You can greatly increase your odds of getting the money shot of a fast moving subject by using continuous drive mode. It’s usually located in the same place as your timer and looks like a stack of images. You may be able to choose how fast the burst of images are taken. If you are photographing a particularly fast moving subject, choose high speed. But remember, no matter how many shots are taking with one shutter click, none of them will be sharp if you haven’t locked autofocus on the subject first! Usually, the best bet for wildlife photography is the longest lens with the widest aperture you can get. But sometimes a long lens is overkill. We’ve spotted moose so close to the edge of a road that the photographers on tour with 400 mm lenses where getting only eyelashes. Also, it’s sometimes nice to take wildlife/environmental shots, or use wide angle for funny distortions [best done with moose faces at Alaska Wildlife Conservation Center]. Bottom line is to have as many lens choices onboard as you can. If you are taking a special trip just for wildlife, you might consider lens rental for some of the longer, more expensive glass. 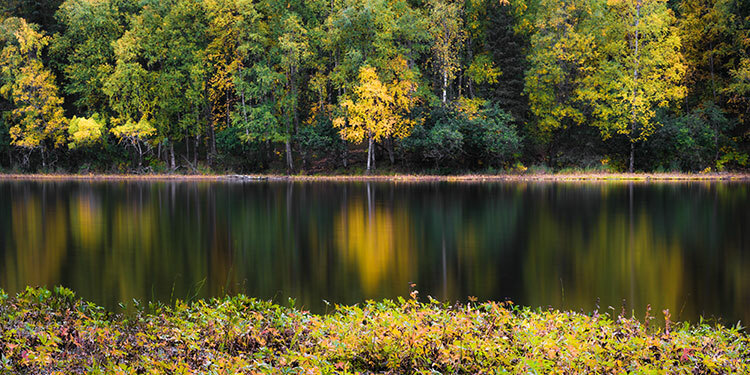 Stewart’s Photo Shop offers a pretty nice selection in the Anchorage area. With a well planned wildlife photography expedition and a lot of patience, the luck variable should take care of itself. 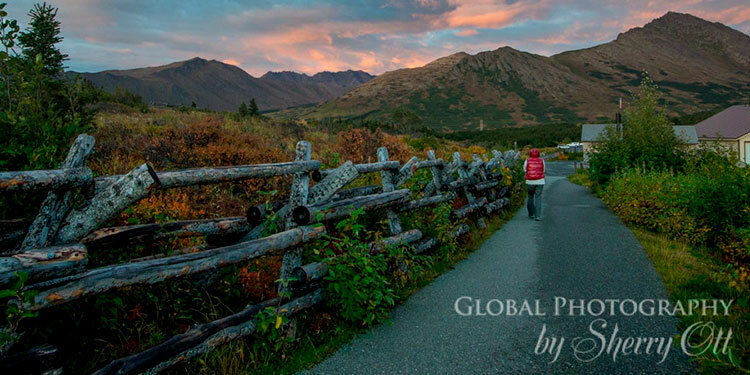 Wishing you much success with photographing Alaska’s many wild and wonderful species!